It’s astonishing to think that 844 million people don’t have access to safe water. That’s one in every nine. 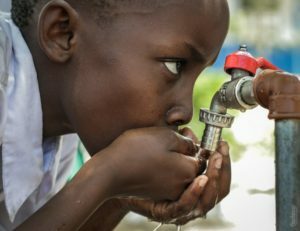 While turning on the tap might be a mindlessly easy task in your home, there is an overwhelming need for a long-term answer to a long-running global problem. Here’s how science is turning safe running water from a privilege to a priority. Current water refining systems are competent. Almost. However, the increasing global population furthers a greater need for free-flowing, disease-free water. The traditional methods of filtering surface water sources (reservoirs and lakes) or groundwater supplies (springs and wells) aren’t enough to sustain demand. The alternative has water sourced from perhaps the most unlikely of places: our toilets. More or less. Global water treatment company PWNT is researching refinement methods that seek to filter sewerage and polluted rivers, producing safe drinking water from waste water sources. In densely populated cities with little available space, alternatives to enormous treatment facilities are needed urgently. PWNT currently uses a combination of ion exchange filters (think large scale versions of your Brita water filter jugs) and ceramic membrane technology to achieve a more efficient and economically viable method of producing water. The plan is to extend that ethos to more readily available recyclable sources by 2020 – a mere few months away. Craig Criddle and Bill Mitch claim that they’re there already. The Stanford environmental engineers have been looking at more sustainable ways of treating wastewater. In doing so, their research took them to resurrecting bacteria to help in the fight against contamination using a system known as anaerobic processing – very similar in principle to biogas production. A California-based plant is already in production, with the Silicon Valley Clean Water utility assessing its productivity for possible expansion upon its success. Another technology in its infancy that takes aims at water pollutants is the nanoparticle filtration system. Developed by the Indian Institute of Technology Madras, the cheap and contaminant targeting biological filtration method uniquely both kills microbes and removes deadly pollutants such as lead and arsenic. Made from inexpensive materials (including the chitin from crustacean shells) and produced using little energy, the technology looks certain to expand to large scale production in the near future. Almost cruelly, two thirds of our planet is covered in a form of water that humans can’t digest. The salty brine of the ocean isn’t made for our bodies, but that hasn’t stopped scientists from trying to find a way to make it so. In its simplest form, distilling saline by simply boiling and capturing the steam is a fairly straightforward method of removing the deadly salt from the ocean. On large scale production however, it’s cumbersome, energy-extensive and prohibitively expensive. Recent developments have seen a filtration method that uses a graphene-woven membrane to sieve out the sea salt, potentially kick-starting a desalination revolution that could solve global thirst and contamination issues for the next generation. A near infinite supply of recyclable, fresh water that’s safe for consumption? That’s certainly no drop in the ocean.